Coronado the peninsula that guards San Diego Bay is also worth a visit for the nice views or many harbor cruises you can go on. Also make sure to check out the local marine life as San Diego Bay is home to many fish and bird species and of course the seals. North of San Diego Bay lies Mission Bay and the seaside community of Point Loma to the west where the Cabrillo National Monument offers some amazing views. 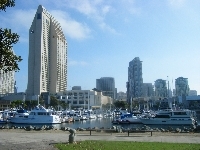 Did you enjoy San Diego Bay Area and have you been on a holiday in San Diego, United States?